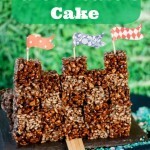 This is a very simple and effective way to make a no bake castle cake. This Minecraft castle cake will be sure to be a hit at any party! 3 oz / 80g butter or non diary spread. Place the butter, syrup, cocoa powder and sugar into a saucepan and melt over a low heat. Place the rice cereal into a large bowl, pour the melted chocolate mix over and gently fold in with a spatula until all the cereal is coated. Line a 6? x 10? (or 8? x 8?) straight sided baking tray with lightly oiled cling film, pour in the chocolate crispie mix and press down firmly. Leave to set for a couple of hours. Once set turn the cake out, peel off the cling film and using a sharp knife cut into 1? squares. Using a dab of icing to stick the pieces together and to a base to build up the front wall of the castle – I built mine on a slate cheeseboard – once the front is finished use extra blocks to build side walls. Once finished place your castle on a “moat” of blue fabric, sprinkled with blue sprinkles. Add flags to the castle, and a drawbridge made of lolly sticks.